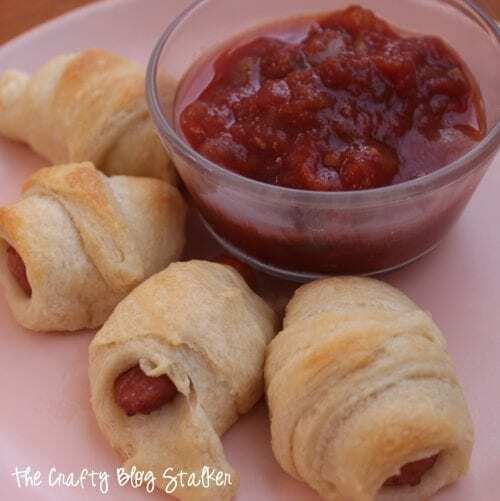 Pigs in a Blanket or Lil’ Smokies Wraps, whatever you call them this is a delicious snack! An easy DIY tutorial recipe idea. Looking for a quick snack idea, or something to bring to the tailgate party? These little bites of yummy goodness are amazing and a sure crowd pleaser! 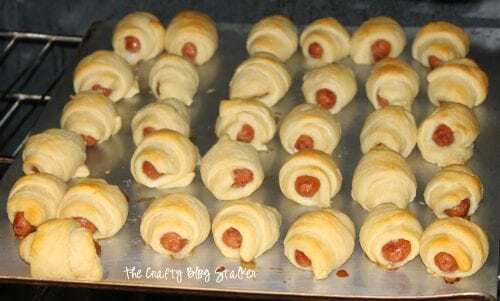 Baking hot dogs in crescent rolls aren’t a new, but I still wanted to share because they really are that good. And these aren’t just hot dogs, these are Lil’ Smokies! Cut each piece of crescent roll dough in half. Put 1 Lit’l Smokie on the wide end of the roll and roll to the skinny end. I was showing my Mom how easy they are to make. Here she is right before we put them in the oven. Bake according to the crescent roll directions. When the timer dings you will find these golden delicious goodies. Grab a cup of your dip of choice and you are ready to go! I love to dip them in marinara and my homemade ranch. They were a hit at my Mom’s and we all had a couple helpings. 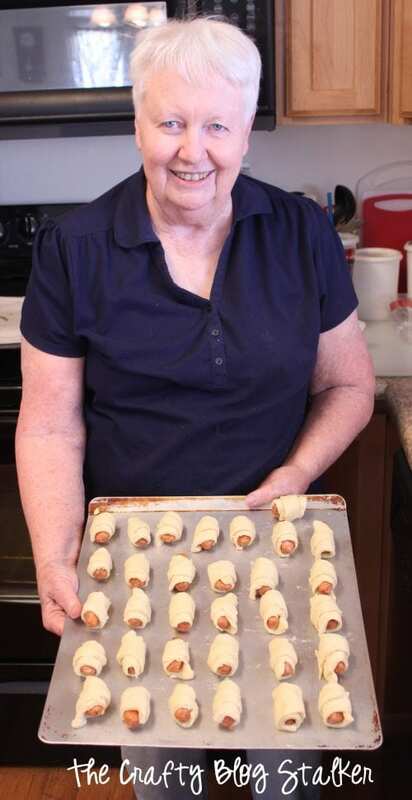 Do you have a favorite snack recipe you’d like to share? Leave a comment below! SAVE THESE LIT’L SMOKIES WRAPS TO YOUR FAVORITE SNACK RECIPES PINTEREST BOARD! NUM! We love those things. Sometimes I put a couple shreds of cheese and a smear of BBQ sauce in with ours. That makes them SO GOOD! Hi, I saw your post on Gunny Sack Link Party #74. Those Smokie Wraps look amazing! My post is #34. I always forget about these little appetizers …. I love them! Hi Katie! Came from Mrigold’s Loft party and these are perfect for my guys! They love finger food on the weekends and since we are getting buried in snow tonight…guess what is on the menu this weekend! Yup your little smokie wraps! Genious! thanks for sharing! Pinning! I love little smokies. Thanks for sharing this quick and easy recipe. Love it! Such a great appetizer to make for parties and such. Thanks so much for stopping by my blog! I appreciate your visit! These look so good. 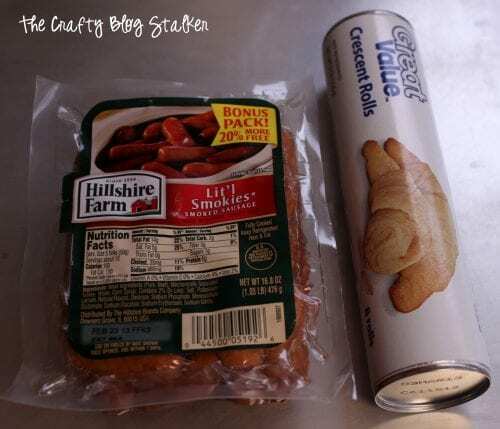 I love making crescent dogs and never thought of using lil’ smokies. I bet they are wonderful. This is going to get pinned under my weekend food category! I would love it if you would bring this recipe and some of your crafts by my In and Out of the Kitchen link party! It is going on strong – I even have a giveaway! Yummy, we make something similar here – translated it is called “Viennas in Pyjamas” 🙂 Love them! These look so easy and delicious! I bet using the lil’ smokies instead of hot dogs makes it a little classier! These are my go-to appetizer for pretty much all parties, love them! Thanks for sharing on the weekend re-Treat Link Party! Hope to see you again tomorrow. These are so little and so cute! Perfect for any party or event snack! Definitely making these as my birthday treats! Thank you so much for sharing!yum yum yummy!